Dwarves in strange moods will create legendary artifacts: unique, "named" items which are of unsurpassable quality (and often value as well). An artifact is the ultimate expression of a dwarf's desires, fears, memories and hopes in art form, and each dwarf will produce at most one in their lives (or die trying). Dwarves that create an artifact immediately gain enough experience to boost them to legendary level in the affected skill, unless they were possessed. Dwarves drop artifacts in the workshop as soon as they are made. They can be traded, just like any item of its type. A list of all artifacts in the fortress can be seen by pressing L (l in version 0.40). As of 0.44, though, artifacts can be stolen, sold or warred over, and may transfer between civilizations that way. Artifact doors and hatches provide indestructible, instantly lockable gates. Finished goods are not particularly useful, only adding to your wealth (and all of the things that entails). 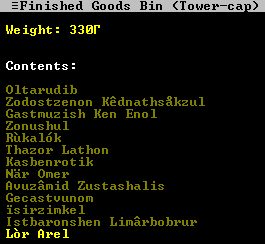 This bin is clutter for the fortress, but any and every thief's dream score, an object of worship for three different kobold civilizations. An artifact gem is called a perfect gem and functions the same as a large gem, having all the same uses, i.e., none. Since the new update, it has been possible to trade all artifacts, including gems, so perfect gems are useful both for boosting fortress value and boosting exported wealth. Artifact finished goods solely add to value of your fortress, or they can be traded in Adventurer Mode. The newly added display cases and pedestals can be used to show off otherwise useless artifact crafts. Artifacts can include books written by historical figures. Where they are stored is recorded during worldgen, and can be discovered in Legends mode. Adventurers can also receive quests to retrieve artifacts. This article or section is incomplete/under construction (likely due to recent changes) and may still be outdated or missing details. Feel free to do some testing and expand it. When an artifact is created, its creator will claim their artifact for a particular purpose. Examples include offering it to your fortress's civilization or site government ("He/She offers it to <entity>"), claiming it as a family heirloom ("He/she claims it as a family heirloom", or alternatively "He/she claims it as a family heirloom in the name of the family ancestor <figure>", although this doesn't seem to change the nature of the claim), or claiming it as a personal treasure ("He/she claims it as a personal treasure"). It's currently unknown at the time of writing what exactly these classifications affect, although there is reasonable speculation it affects historical generated raid events, as well as raids on your fortress should you possess a foreign artifact.